Superfly SS features beautifully shaped tubes, including this attractive top tube/seat tube junction (click to enlarge). My biggest initial concern when swinging a leg over the Superfly SS was trail harshness. Considering this bike has no suspension and sports an aluminum frame, my mind immediately hearkened back to the days of chattering teeth, fatigued forearms, and fingers seized permanently around the handlebars. But from the very first ride on Halo Trail above Reno, I was surprised to finish the two-hour slugfest of rock and tight, punchy corners relatively fresh. My triceps were definitely sore from the extra work required to handle Superfly SS over rocks, but two days later, I had bigger triceps. Guess I can cancel that gym membership. 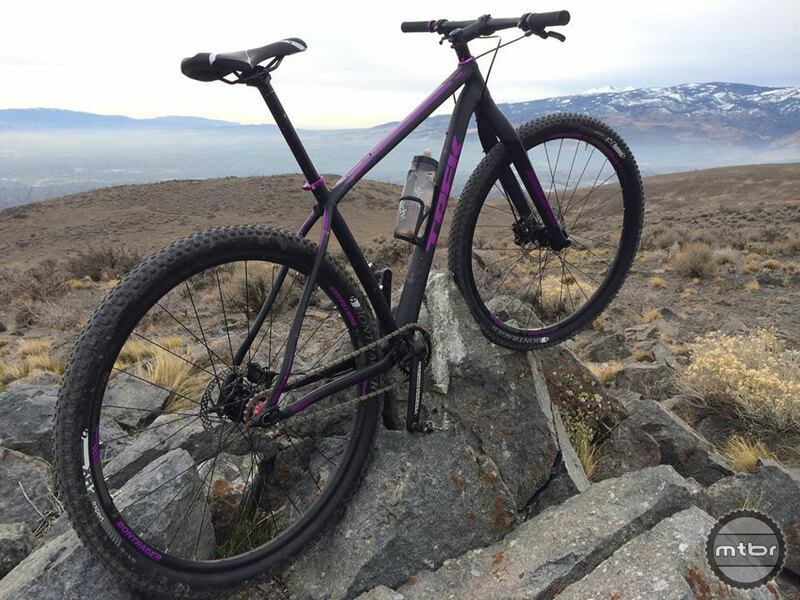 The Double Bevel carbon fork did a respectable job of soaking up trail chatter, but the real story was how well the Superfly SS aluminum frame rode. Forget the harshness associated with aluminum frames of old; whatever Trek engineers did with the Superfly SS frame material and design, it worked. When an aluminum frame rides as nice as the Superfly SS does, springing an extra thousand bucks for carbon fiber seems excessive, especially if you’re a rider that’s hard on equipment. Thanks to a 51mm fork offset and G2 Geometry with a 69.6-degree head angle, Superfly SS steers with scalpel precision. Bottom bracket height is respectable at 12.2 inches, as is a relatively short chainstay length of 17.13 inches make the Superfly SS a quick handling 29er. The Double Bevel carbon fork (left) has enough clearance to accommodate a 3-inch Bontrager Chupacabra tire. The fork easily fits the Chupacabra with ample mud clearance (click to enlarge). In addition to weighing in at only 569 grams with a front thru-axle, another benefit of the Double Bevel carbon fork is the ability to run a 29+ size front tire. 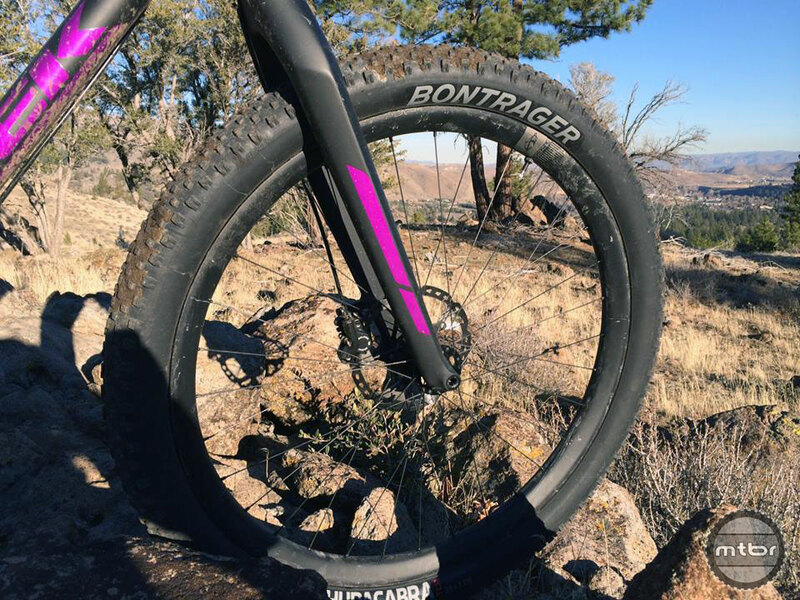 Trek sent over their new Bontrager Chupacabra 29×3.0-inch tire, which easily fits the fork and has plenty of extra room for mud clearance. Throwing a Chupacabra on the front took the capability of Superfly SS to a level higher, with more bump absorption and greater cornering traction thanks to a fast-rolling design with widely spaced knobs. And weighing in just below 900 grams, the Chupacabra is no heavier than most rugged 2.3-inch trail tires. Tires as wide as 2.4-inches can be run out back, and thanks to no seatstay or chainstay tube bridges, there’s plenty of mud clearance (click to enlarge). Frame clearance out back isn’t wide enough to accommodate a Chupacabra, but I was able to fit a 2.35-inch wide Maxxis High Roller II, making the Superfly SS a capable rigid bike in rugged terrain. And thanks to chainstays and seatstays with no bridge tubes in front of the tire, mud clearance is outstanding. 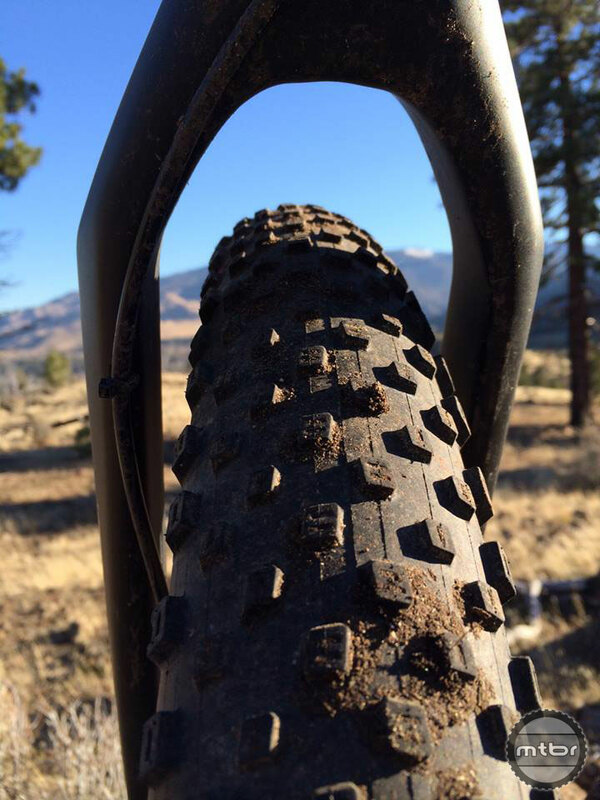 Across heavy mud and even several inches of packed snow, the big-tire capability of Superfly SS makes it a versatile machine for year-round riding. Running tires as wide as the Chupacabra will require rims wider than the stock Bontrager Mustang Elites with 24mm width. To better match the Chupacabra and beef out the High Roller II to a 2.4, I ran a set of Ibis 941 carbon wheels with an internal width of 35mm, making Superfly SS even more comfortable over rocky terrain. Throw a 27.2mm dropper post on, and Superfly SS instantly becomes a rigid singlespeed trail-eating monster. With a 3.0 tire up front and 2.4 out back – the Superfly SS can handle chunky terrain (click to enlarge). As for complaints, there are very few. The aforementioned Stranglehold dropouts aren’t trail-adjustment friendly, the stock 690mm handlebars are too narrow for a singlespeed 29er with no suspension, and the stock Bontrager tubeless kit had leakdown issues. Bottom line, for those in search of a simple, fun, capable, versatile and race-worthy singlespeed rig, there are few bikes that can touch the performance-per-dollar the Superfly SS delivers. And if you’re a Luddite who’s grown tired of high maintenance modern suspension bikes, the Superfly SS is a dream. Literally the only maintenance this bike needs is an occasional lube of the chain and check for tire sealant. Those who own and ride singlespeeds know their magical qualities; a bike with only one gear makes you a fitter and faster rider. And a bike with no suspension teaches you how to pick clean, efficient lines. Put these two together and you have Superfly SS, a bike that will make you a fitter, faster and more skilled mountain biker without putting a gaping hole in your bank account. 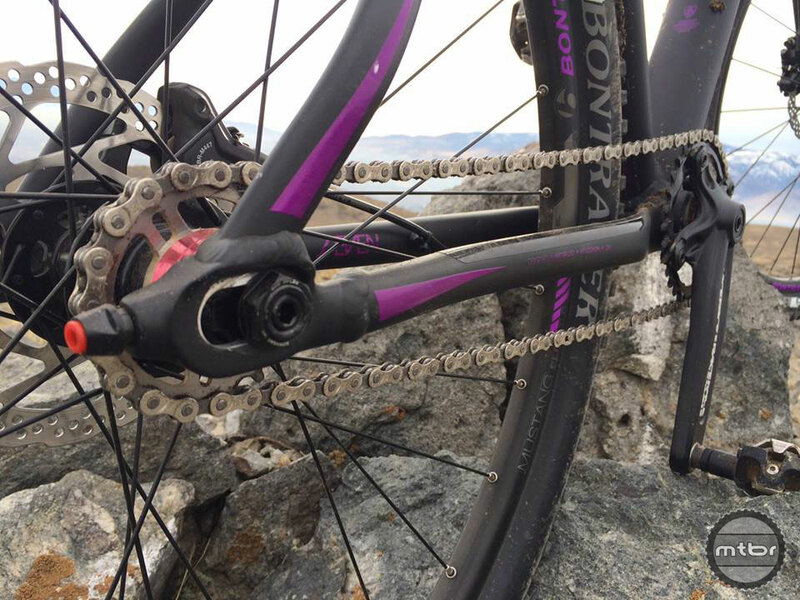 The winding, technical rockiness of Halo Trail on Peavine Mountain above Reno is a perfect testing ground for how a bike handles. Clean lines and graphics with hydroformed tubes make Superfly SS a real eye-catcher. 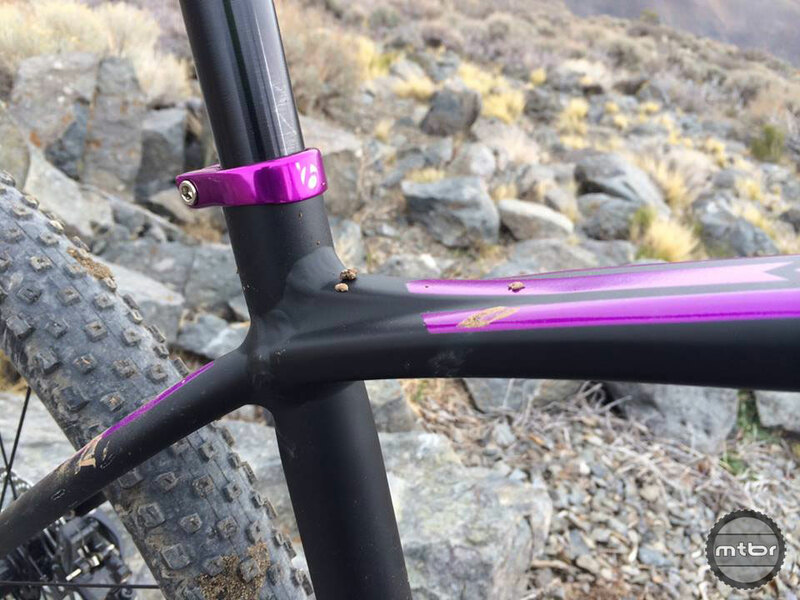 The new Stranglehold dropout design had zero slip issues throughout the test period. 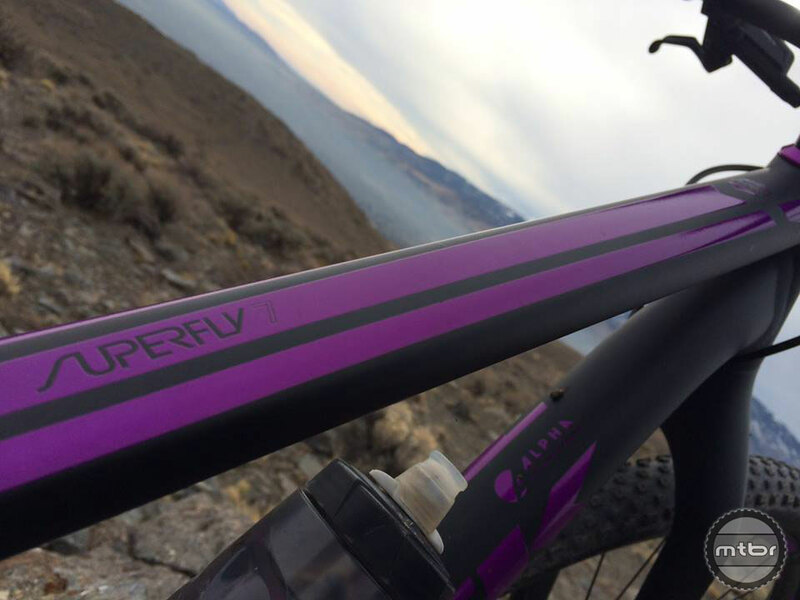 Superfly SS features beautifully shaped tubes, including this attractive top tube/seat tube junction. Tires as wide as 2.4-inches can be run out back, and thanks to no seatstay or chainstay tube bridges, there’s plenty of mud clearance. 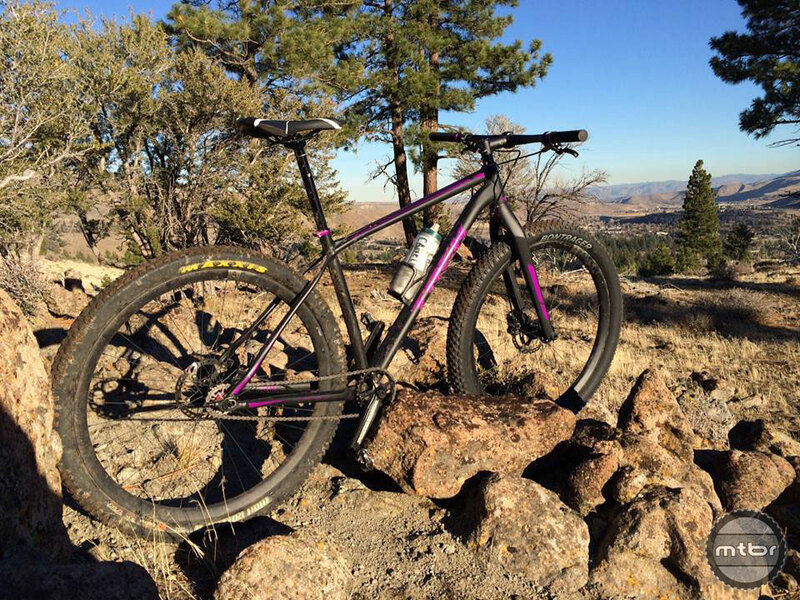 3.0 up front and 2.4 out back – Superfly SS can be built to handle chunky terrain. I’m with Bryce Moore from the FB comments. This might be the lightest bike available for $1600, but at that price you would think they’d throw buyers a bone and spec decent brakes. Seems to expensive for the list unless the frame is made of platinum or this is some uber rare fork. I think that all of the haters complaining about the price don’t understand the economies of scale here. This is their top end aluminum frame. Trek makes a bike with the same frame (Superfly 5) with an inexpensive RS XC32 fork and mixed Shimano/SRAM drivetrain for the same money, true, but they will sell thousands and thousands of those. This bike has unique dropouts, a carbon fork, through axles front and rear, and some low volume SS specific parts. They will sell only a few hundred of this bike, which makes it way more expensive to manufacture. And it weighs 20 lbs. Sounds like a value to me. Nice review Kurt. I own this bike and consider it a great value. I am just as fast on this bike as I am on my $5,000 anthem advanced 1. This bike will make you a stronger and better rider. There is no price for that. I say $1600 for a new, 20lb bike is simply unheard-of, in today’s MTB circles. I’m curious to demo one now! I would just buy a Nashbar 29er single speed for $350, and be done with it… hehehehe. Oh Oh…. let me brace myself for the firing squad. Honestly, I have mine down to 23 pounds, along with a Salsa fork at an XL size, and the geometry is amazing for a bike at this price. I could maybe go down a little more in weight, but why? I find any bike less than 23 pounds twitchy, and unbalanced. I sold almost all my expensive bikes after realizing that most bikes are just over priced. This Trek is just ridiculous at $1600. Not even Richie Rich would pay $1600 for this bike with single speed. you can’t possibly believe a nashbar and a superfly ride anywhere near the same, do you? Actually no, fixing tires is a breeze. 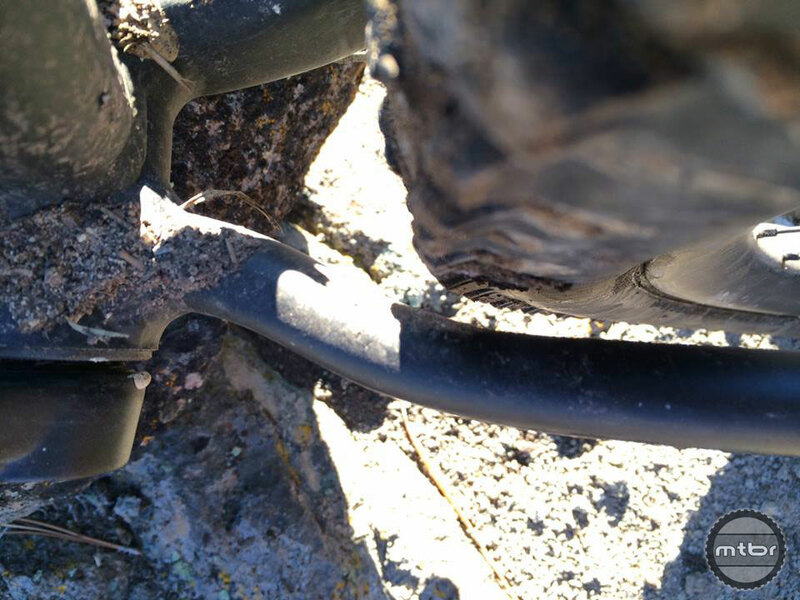 The QR 12 thru axles just unclamp and unscrew – pull the wheel right off. Its adjusting the chain length that is a hassle due to the 22mm bolt thats the issue – but the really isn’t a normal kind of field repair someone has to do. the only reason you’ld normally have to deal with that is if you didn’t torque it down hard enought before you went out. I’ve never had mine slip, either on this bike or on my Trek Stache 29+ that uses the same system.